I had a very nice trip to Seattle this past weekend. The weather was reasonable (for Seattle!) The Evergreen meetings went well. We were privileged to hear the excellent preaching of the Reverend Jacqueline Thompson, Assistant Pastor at Allen Temple Baptist Church in Oakland, who urged us to remain faithful to our calling to be an inclusive community of people and congregations. It was great to visit with old friends and a delight to preach at Seattle First Baptist Church on Sunday. The worship service was lovely, the choir and organ outstanding and the day filled with many fond memories. By all reports it was a good day at FBCPA as well. Thanks to Tripp for preaching, to Carolyn for working with the children and youth and to Nana for hosting a “visit to Lebanon.” I heard that her presentation was very good, the décor lovely and the food outstanding. Of course, I knew it would be. I’m sorry I missed it. Sunday we will visit India under the guidance of the Hunwicks. Worship will focus on the 38th chapter of Job at the point at which God begins to speak to the Job from the whirlwind. What happens when we bring our grievances before God with an expectation that justice will be done? Job is confronted with an order of reality that goes far beyond his comprehension, that challenges his conception of justice, and that teaches him a lesson about being a creature, albeit one attended to and loved by God. After worship we will hold our Quarterly Business Meeting, which will include a Special Business Meeting to consider a change to our church constitution’s quorum requirements. The sole purpose of this amendment is to make it easier for us to conduct church business, since current quorums are a burden to meet. There is no intention to purge our roles or exclude anyone who wants to be a member in this process. We want every member who is willing and able to join in making this decision and, more importantly, to engage in every aspect of our community life, including its business. So don’t’ forget – 10:00 AM in the sanctuary for worship, sharing and learning and then stay for the business meeting. Bring a family member, friend, colleague or neighbor (or three!) to join us. Strangers are welcome, too! Diana Butler Bass is a respected and well known sociologist and historian who has written several books on the subject of the present day cultural shift of America’s relationship to its religious institutions. Here is a link to a video that some of you might find interesting. Get something to drink. Pull up a chair. While the popular number may be 90%, when age categories are considered, it’s much lower. In fact, Diana says among those 40 and younger the number is less than half. Diana says too many of today’s churches are not leaving enough space for the doubters. Tomorrow’s faith communities will have to more fully commit to engaging doubt and uncertainty. Too much of the Church still favors comfort over change – and the transformational effects of the Gospel go untapped. Diana says this will have to change in order for the church to fully flourish. This weekend I will be attending the annual meeting of the Evergreen Association of American Baptist Churches in Seattle, representing our congregation. 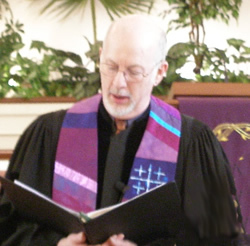 On Sunday I have been invited to preach at Seattle First Baptist Church. This year marks the 40th anniversary of my internship at that church. From July 1971 through August 1972, I worked full time there under the able supervision of Walt Pulliam. I lived in a basement apartment under the sanctuary. During that year, among many other duties, I helped to start a young adults ministry in the congregation. It was a wonderful year, one that contributed to my pastoral identity and sense of how to do ministry in the local congregation. I am grateful for this opportunity to return. Due to scheduling conflicts, we have pushed back our time with Jennifer Davidson form ABSW to the end of this month and the beginning of next. So she will not be with us this Sunday. Pastor Tripp will be preaching and Carolyn Shepard will be with our children and youth. Nana Spiridon will be our special guide to Lebanon and our mission work there. In Adult Spiritual Formation, we will conclude our work with Brad Berglund’s, Reinventing Sunday, as part of our journey into the Spirituality of Worship. Don’t’ forget – 10:00 AM in the sanctuary for worship, sharing and learning. Bring a family member, friend, colleague or neighbor (or three!) to join us. Strangers are welcome, too! October is the month we focus on the world in which we live and celebrate the diversity of its people and cultures. In many ways, Baptist denominational life began with congregations joining together to support missionaries around the world. Though the missions scene has changed considerably in recent years, there is still a significant amount of good work being done for the sake of the gospel by American Baptist missionaries around the world. In addition to supporting our American Baptist mission boards, we have also committed to helping two mission teams as our special interest missionaries. For several years now, we have been sending money to Dan and Sarah Chetti, working in Beirut, Lebanon. Last year we added Dan Buttry, who travels the globe, serving as a peace consultant in troubled lands. This Sunday is World Communion Sunday. We will gather around the table to share the common meal that Christians everywhere will be sharing with us. We will use songs and liturgy from many countries and we will set the table with a variety of breads. You are encouraged to wear something from a different land – that of your origin or a place you have visited or with which you are fascinated. If you have some art or artifact you want to share, we will have tables, easels, etc. to help with display. (Please bring those ahead of time, if at all possible.) Pastor Tripp will be preaching on the Holy Family, using Mark 10:2-16 as his text. In Adult Spiritual Formation, we will conclude our work with Brad Berglund’s, Reinventing Sunday, as part of our journey into the Spirituality of Worship. See you at 10:00 AM in the sanctuary for worship, sharing and learning. Bring a family member, friend, colleague or neighbor (or three!) to join us. Strangers are welcome, too! Take note of this passage from a recent article published in Associated Baptist Press News. It seems appropriate to share given our present conversations about worship at FBCPA. The article entitled, “Contemplative Worship Fits Baptist Faith” raises many interesting questions and offers encouragement to congregations which are exploring various ways of renewing worship practices. Some congregations are even practicing weekly communion! Surprising stuff! We have met for three weeks now to discuss what worship means to us as individuals and a community of faith. We’ve talked about history and spirituality. Just this week we discussed how baptists like Brad Berglund, John Skoglund, and Molly Marshall (the present Dean and President of Central Baptist Theological Seminary) are using language like “sacrament” again. What does this mean for the present and future of worship in the Baptist tradition? What might it say to us at First and who we proclaim to be in the midst of the world? How might our worship bear witness to God? Join us. We meet after worship on Sunday mornings at 11:30. All are encouraged to come. If you need child care, please contact the church office this week and I will make certain that it is available. Thanks to everyone who helped make last week’s Talent Show an evening to remember. From Ron Fredlund, Mary Martin and Joanne Jones to the Ramirez family of fine performers, we covered the gamut of congregational talent. Alan Plessinger made his singing debut, films were premiered and the pastors even took the plunge. I was quite surprised to hear that it was Pastor Tripp’s first talent show ever! Hopefully, we now have him thoroughly hooked into planning an even bigger extravaganza next year. We continue our conversation on the Spirituality of Worship on Sunday mornings. I encourage all of you to be part of this rich mix of sharing our experiences and learning about worship. 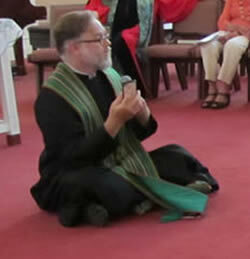 In the promotional comments for our study book, Reinventing Sunday, Ken Medema, several of whose songs we have sung, including our prayer response, “Lord Listen to Your Children Praying,” writes: “Brad Berglund has captured what I believe is the rock-bottom essence of worship; namely, that it is offering ourselves to God.” Those words really stood out for me – the rock-bottom essence of worship is offering ourselves to God. How does that strike you? It certainly says that worship on Sunday morning is more than just the service order we follow. It is fundamentally about our relationship to God. What do we bring to that relationship? What do we expect from it? How we prepare for and how we experience this weekly encounter has been a key topic in our conversations so far. We would love to have your input on these matters, too, as we search to know what it means for our community to gather in worship. This week concludes our journey with James. In the final chapter of this letter, the writer reminds us to sing songs of praise when we are cheerful, to pray when we are suffering and to pray for one another when healing is needed. Consistently throughout the letter the writer is concerned that we make practical application of our spiritual understanding. What more significant thing can we do than to pray for one another? To remember sisters and brothers both here and around the globe as we bring our joys and concerns to that healing, empowering, enlivening relationship that God offers each of us? So, let’s join together in prayer and song, in sharing our joys, our concerns and our experience of worship. See you at 10:00 AM in the sanctuary. Bring a family member, friend, colleague or neighbor (or three!) to join us. Strangers are welcome, too! We have begun an important conversation about worship on Sunday mornings during our time for adult spiritual formation. This Sunday morning time for adults is different than what we used to do in the Adult Forum. The Forum was particularly challenging intellectually and we worked a lot “in our heads.” But there is knowledge and wisdom that also emanates from the heart and from the spirit. I would like to encourage all our adults to engage in this in-depth exploration of The Spirituality of Worship. What we are doing during this hour can help to shape our understanding of what worship is, why we do it and how we do it. As Thelma Parodi has reminded us more than once, worship is the “practice of the presence of God.” How do we experience God’s presence? How do we discern what God is communicating to us? How do we identify where God is leading us? How do we say “Thy will be done,” “help,” “please” and “thank you” to the One who made us and, through grace, is constantly drawing us back into that Oneness? It would be beneficial to you personally and to the congregation as a whole to have your participation in this conversation that is vital to our future. We continue our journey through the book of James, considering this week what it might mean to be “born of wisdom.” James has some timely thoughts especially for us, immersed as we are in this high political season. “Who is wise and understanding among you?” James asks and then responds, “Show by your good life that your works are done with gentleness born of wisdom.” A lovely turn of phrase, a challenging word to follow. How can we navigate this world in which we live as people whose lives are “born of wisdom,” the wisdom that comes from God and promises to transform the world? Let us join together in song and prayer, in word and the search for wisdom as we worship and work on our spiritual formation. See you at 10:00 AM in the sanctuary. Bring a family member, friend, colleague or neighbor (or three!) to join us. Strangers are welcome, too!